In this test, a serum sample is analysed for the presence of IgE and IgG4 antibodies which have a precise affinity for specific dietary allergens and intolerances. The quantitative summation of the IgE and IgG4 results within the offending food groups are expressed graphically. The elimination of the offending food groups from the diet has been shown to reduce the severity of symptoms associated with food allergies. 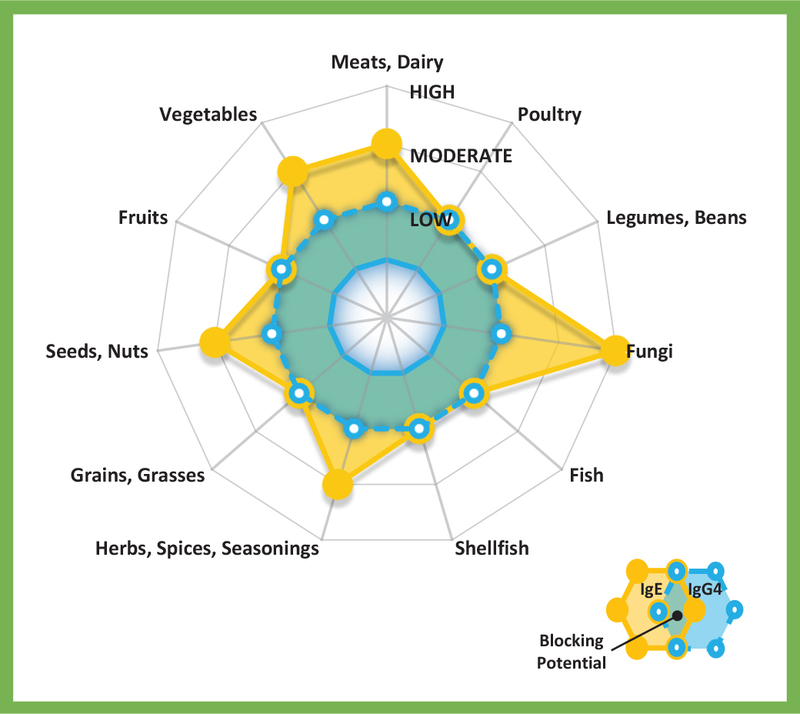 In addition to listing the individual IgE & IgG4 responses to each food, the report also groups the results into food groups, displaying their IgE and IgG4 readings in graphical form. At very high levels, IgG4 antibodies alone can trigger an immune response within the body themselves. However, data is available that provides support for the notion that IgG4 can serve another specific function of controlling IgE antigen recognition and consequently regulating anaphylactic reactions and IgE-mediated immunity. IgG4 can act as a blocking agent by preventing IgE from binding to targeted receptor sites and releasing histamine. This is referred to as the blocking potential.